In my defense, these are delicious. I apologize in advance for offending anyone with this obviously overindulgent dessert. But one bite in and I think you’ll be singing a different tune. Nay, even thanking me! Man, so glad we worked through this, guys. What do you say? Let’s make whoopie pie s’mores! Do you know what a whoopie pie is? If not, go study up. Part of the lure of s’mores is the crunchy graham crackers (for that, try these S’mores Bars). But what if the chocolate bar was the slightly “crunchy” part, and the crackers were replaced with soft and tender chocolate cake? I mean…what’s not to love? I knew you’d come around. These s’mores are easy to make, as the whoopie cakes require just 1 bowl! The rest happens on a baking sheet (or over the open fire if you’re cool like that – just don’t rub it in our faces). The assembly is quite easy. Make cakes, top with chocolate and marshmallows, toast, top with fruit (optional for color), smash, and enjoy! These are thee perfect dessert for warm weather, especially BBQs and outdoor gatherings. If you’re going camping, make the cakes ahead of time, toast your mallows on the fire, and go to town! What a lovely summer activity that would be. It’s officially added to my summer bucket list. If you try this recipe, let us know! Leave a comment, rate it, and don’t forget to tag a picture #minimalistbaker on Instagram so we can see your s’mores creations. Cheers, friends! 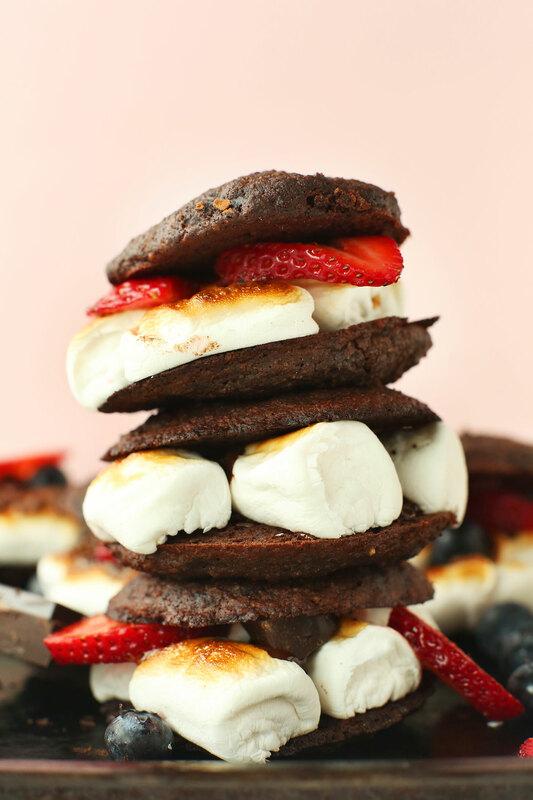 Amazing whoopie pie s'mores made with 1-bowl chocolate cakes, toasted vegan marshmallows, dark chocolate, and fruit! 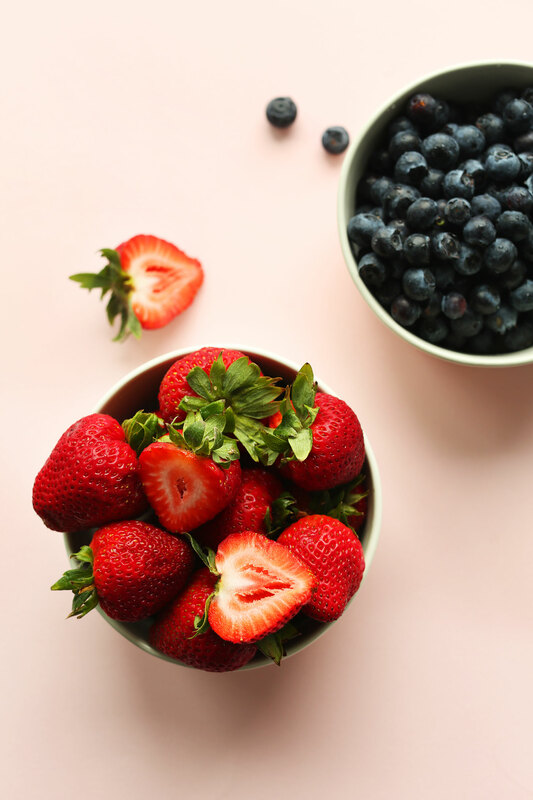 The perfect summer treat! Make chocolate cakes by measuring out almond milk in a liquid measuring cup, adding apple cider vinegar (or lemon juice) and baking soda, and stirring. Set aside. In a large mixing bowl, prepare flax eggs by combining water and flaxseed meal. Let rest for 5 minutes while you prepare your other ingredients. Next, add applesauce, vanilla, and salt and whisk to combine. Then add almond milk mixture and whisk again until everything is thoroughly incorporated - about 30 seconds. 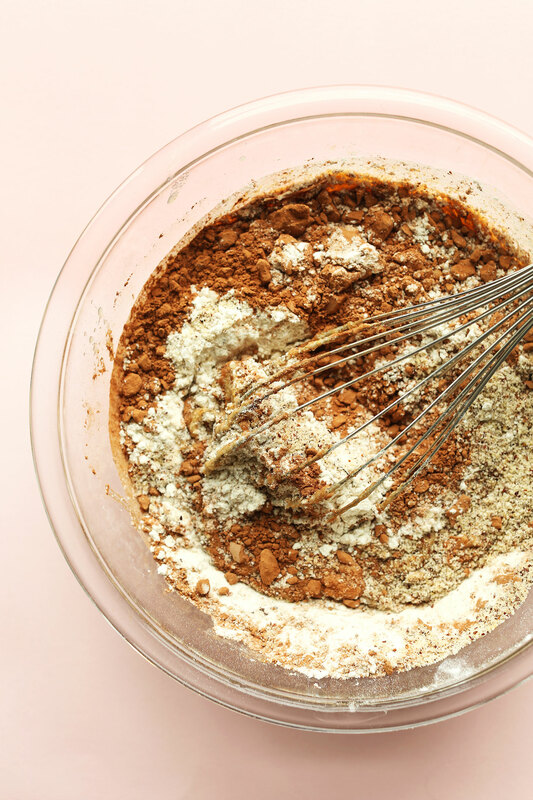 Lastly, add baking powder, cocoa powder, almond meal, oat flour, and gluten-free flour, and whisk to combine, making sure no large lumps remain. Transfer batter to the refrigerator to chill/thicken for 20 minutes, and preheat oven to 350 degrees F (176 C). Grease two large baking sheets (use more or less if altering batch size) with nonstick spray (if you don’t have two baking sheets, just use one and bake the cakes in 3-4 batches). Repeat this process, baking the mini cakes until all batter is used - you should have about 40-48 total cakes. 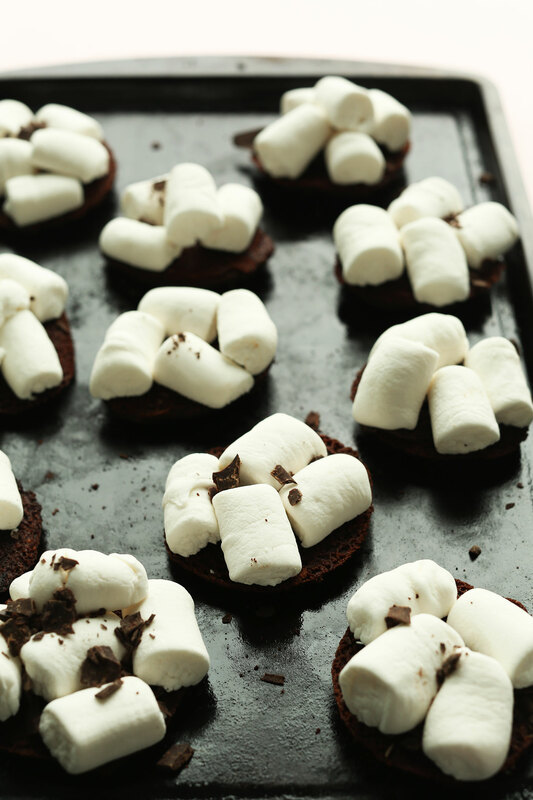 Once the cakes are completely cooled, arrange half of the cakes on 1-2 baking sheets (upside down) and top each with a chocolate square and several halved marshmallows. Broil on the top rack of the oven on high broil until toasty and brown. Watch carefully as they will burn/toast quickly! (Alternatively, if using a grill or campfire, toast the marshmallows over the fire and place between cakes once toasted). Top with fruit (optional) and another cake of similar size and shape and press down slightly. Enjoy immediately! Best when fresh. Leftover cakes will keep covered at room temperature up to 3 days or in the freezer up to 1 month. *Whoopie Pie Cakes from my Vegan Whoopie Pies. *Nutrition information is a rough estimate calculated with chocolate and fruit. Oh Boy! These look delicious. Thanks for sharing the recipe. I am a great chocolate lover and adore the traditional methods of making chocolate chip cookies and cakes. I like your style of cooking which looks unconventional but follows traditional methods. Great Work Dana. Made these today (exactly as written, no subs) while babies were napping. Came together super quick (love the one bowl business–yaaaassss)! They are moist, soft, but have no problem holding all of that goodness. We really enjoyed these. Thank you and happy Friday. This is such a fun twist on the traditional s’more! I’m a huge chocolate lover, so I can’t wait to try swapping out graham crackers for whoopie pies:) Sounds so delicious! Ahh these look so good! 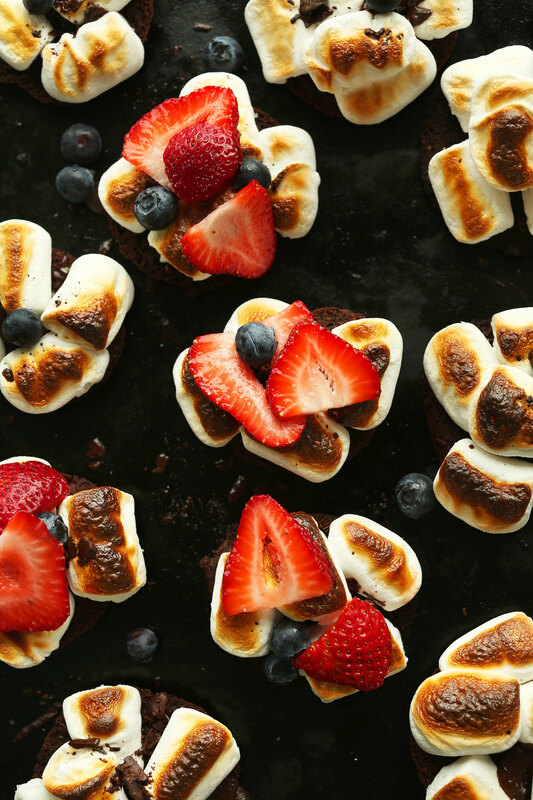 Im down with s’mores of any kind but these look to die for. Oh my geeeeee! 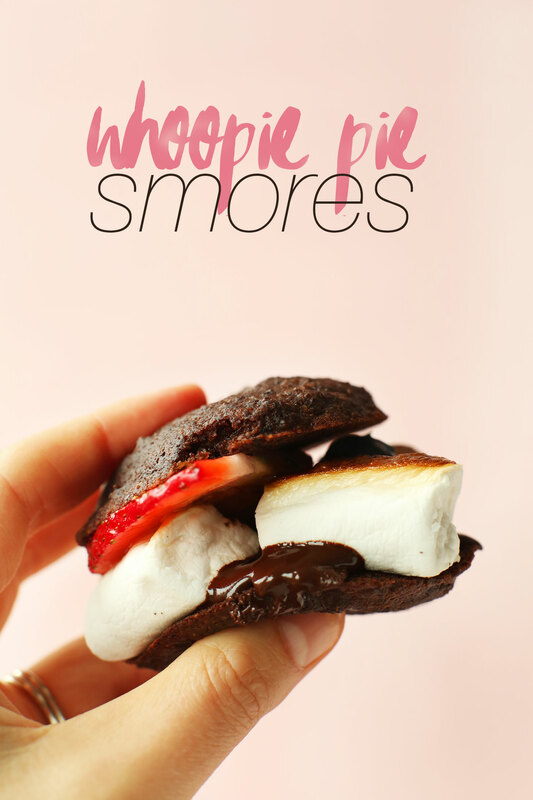 I think you just put two of my favs together – whoopie pies + smores. High fives for another GENIUS idea! Ha! thanks Janel. Hope you give them a try! This looks to die for! I am have to make this soon! I’d rather roast these over the campfire instead of actual s’mores, haha! What would be the best substitute for applesauce–would canned pumpkin work in this recipe? I think so, yes! If you give it a try, let me know how it goes! I wonder what you would sub for oats? I am allergic, but these look so yummy! See this FAQ for more help! I love you for these. I can’t wait to try them! I’ve made your one bowl gf banana bread so many times I know the recipe by heart…. I have a feeling these might be on that level ? These look soo good. I have to confess to never having made a whoopie pie and I just need to jump that hurdle. 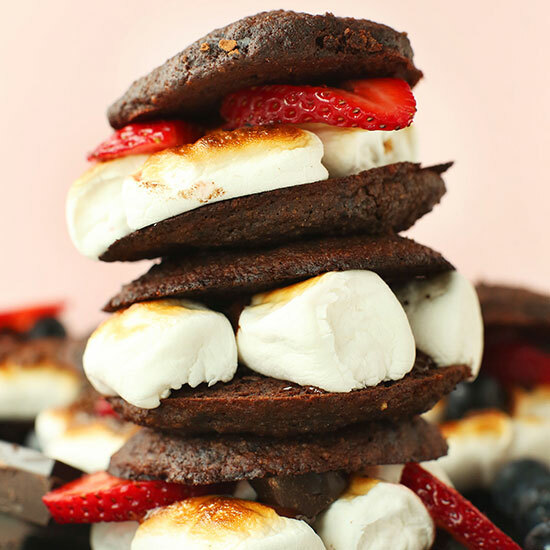 These Whoopie Pie S’mores are the firecracker that I need to make me jump!